Each Monday from Rambling In The Garden Cathy invites us to share a vase assembled from materials collected in our gardens. 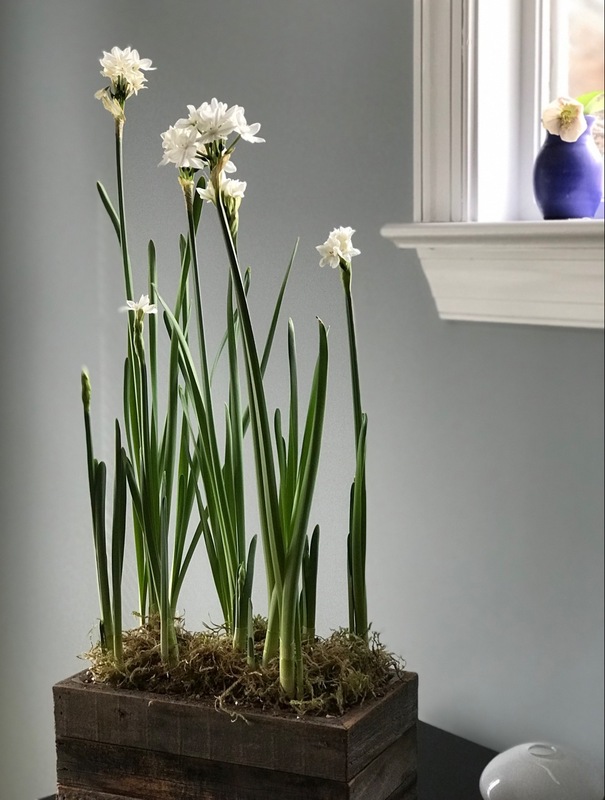 Today’s vase is from my indoor garden courtesy of my beautiful niece Julie and her family who surprised us with a Christmas gift of paperwhite Narcissus, preplanted in an old wooden box. The bulbs have opened at different rates, beginning with a particularly eager one that sprouted greenery 3 or 4 times faster than the others. It bloomed for a few days alone in its splendor, until several others could catch up. In hindsight I think the paperwhites may have wanted a sunnier location than our east-facing kitchen window, but all in all they have been happy. We have been enjoying the fresh springlike blooms though spring weather feels far away. 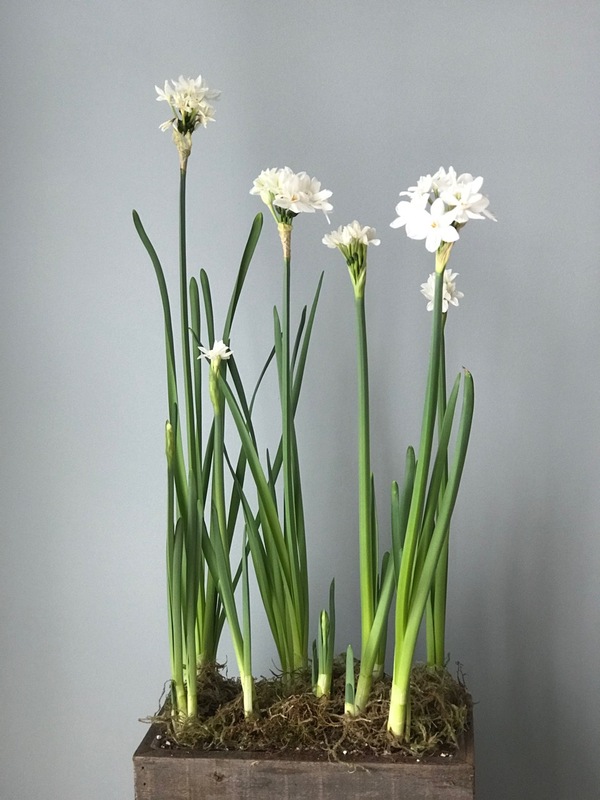 This entry was posted in garden and tagged 2019vase, flower design, in a vase on monday, narcissus, Paperwhites on January 28, 2019 by pbmgarden. I always enjoy everyone else’s Paperwhites much more than my own. I really dislike their perfume. But they are so beautiful and a much needed brightener for these winter days so perhaps I have to try them again. Some flowers do carry a challenge in the fragrance department. 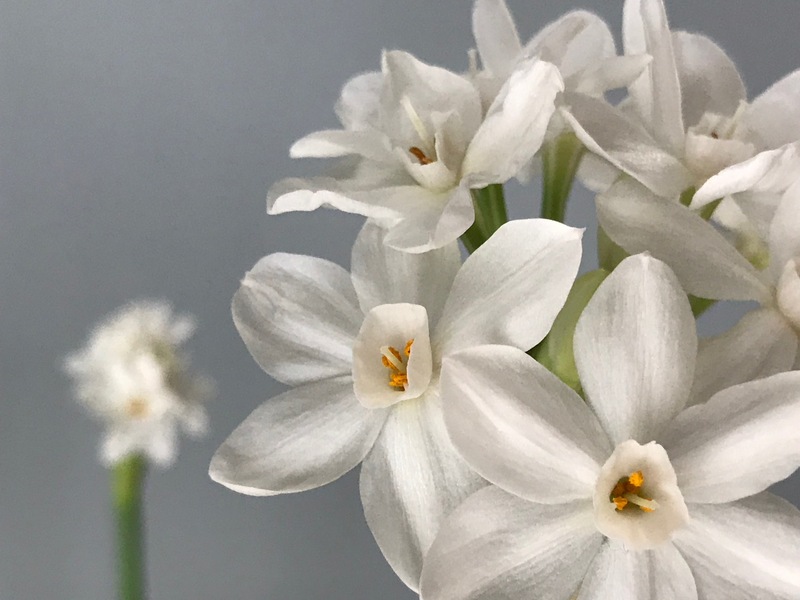 I’ve caught of whiff of these paperwhites’ perfume occasionally, but it hasn’t been too strong or pervasive, fortunately. They are so pretty, and must surely brighten up your home on these winter days. I wish I could bear the scent of them but will have to settle for my Amaryllis instead! What a lovely gift for a gardener. I was surprised to see one in bud in my backyard. It was thoughtful, wasn’t it? Your backyard is blessed then. My neighborhood has a few daffodils blooming despite the low temperatures we had last week in the teens. Have to love their resilience. Thanks, they’ve brought much pleasure. Glad you enjoyed the paperwhites. I haven’t had them in many years. My husband had a health setback before the holidays, but now things are settling down for us so there might be time for IG again! What could be more simple and pretty and smell good too? Beautiful photos. Thank you Alison. Haven’t taken photos much lately and it was enjoyable to photograph the paperwhites. A special gift from Julie and her family. 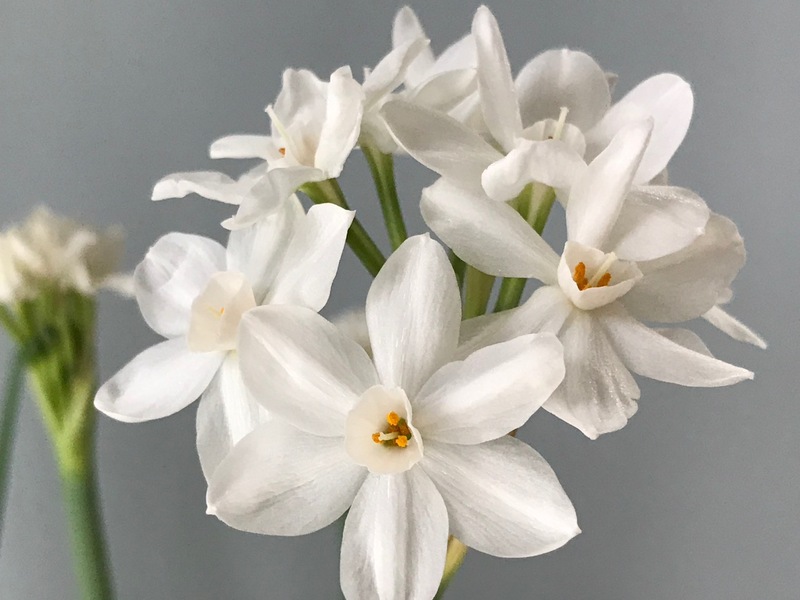 Paperwhites are a delight to the eye and nose. The wood box planter is wonderful. Here’s to spring coming sooner than later! Haven’t had paperwhites in a long time Peter and they’ve been wonderful. Happy to hurry spring along! So pleased you left them uncut…a big like music unplugged…delightful. Acoustic gardening could become a thing Noelle! Yes, good observation Cathy. They do seem sophisticated, even in the rustic box. I great idea to plant them in a wooden box. I love Paperwhites but I keep them in the greenhouse as the smell can be a bit overpowering. Yes, the wooden box adds a nice rustic touch to the elegant paperwhites. The smell hasn’t been terribly strong. I can smell them only if I pass close by. What a wonderful gift! I never grew paperwhites in my former garden but I inherited a large number of them with my current garden and I’ve come to value them tremendously. They pop up in some of the driest areas of my garden well ahead of any other bulb, signaling that spring isn’t all that far off. I need to plant several dozen bulbs next year to plant in other areas – I can use more of their lovely surprise appearances. I should grow paperwhites outdoors too. I have other narcissus that are ready to pop open, but they seem to know it will be 19F this week and they’re biding their time. Always a favorite. I was traveling nonstop in the fall and they were all gone before I got to the nursery. What a thoughtful gift! You’ve had a busy fall and it seems the next year will be exciting as well as busy. My niece’s thoughtfulness in selecting the paperwhites has brought us much enjoyment. I did plant some bulbs outdoors this fall, but it’s been so wet I’m worried even the squirrels won’t want them. It’s very beautiful and refreshing. Love your detailed photos as well. Thanks Beth. A few blooms like this really lift the spirits! These are lovely, all in a row like that. Mine insisted upon flopping over but were mercifully lightly scented. We finally resorted to kebab pokers to hold them up. Thanks Ricki. Kebab pokers work fine don’t they! Interesting your paperwhites are lightly scented as so many readers have commented about the smell. These have not been terribly strong either. These ROK! They are among my favorites, not only because they are white, but because I used to pick them from an abandoned cut flower field in Montara. They were so fragrant, and they just grew sort of wild. They happened to be in rows. When a house was built on the site, the entire field was excavated to remove all of the narcissus that had been naturalized there for so long. Interesting memory about the paperwhites in Montana. What a loss that was to have them excavated. Oh, that was in Montara, with an ‘r’. It is in San Mateo County. Cut flowers were a major agricultural commodity there many years ago. Diego Rivera painted them and those harvesting them commonly. Oh, that is fun. They are lovely, and it’s great to see these harbingers of spring. A beautiful arrangement! The paperwhites really do send us soaring toward spring don’t they. Beth, hope you’re coping with the extremities of climate change. Very nice! 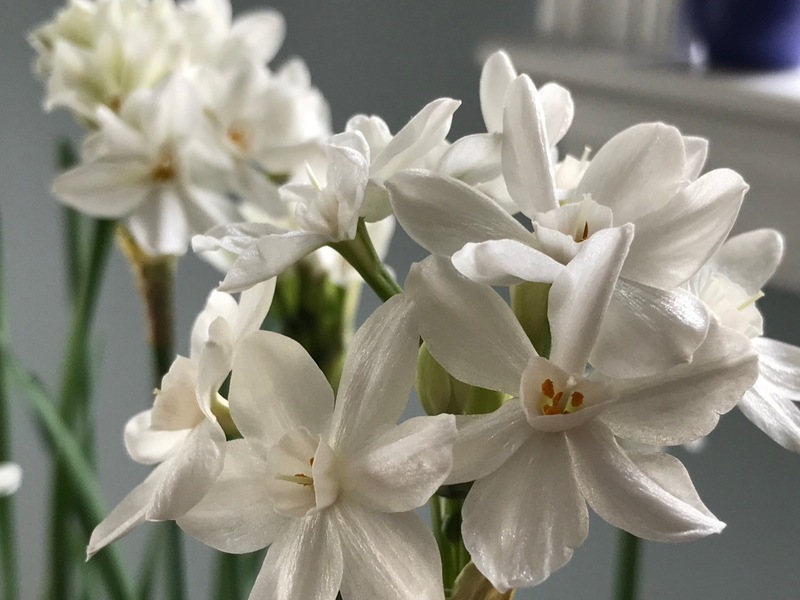 Why didn’t we plant paperwhites this year? I like the planter – how deep do you plant the bulbs? I’ll be looking to reuse the wooded box for paperwhites next year. The container is about 5.25 inches and I expect the bottom is about .5 up to 1-inch thick. So that leaves about 4.5 inches for the bulbs. They were pre-planted, and I think the top was about 0.5 inches from the surface.